I had just spent the last hour having a great time messing up our basement. I had set out a play tent, complete with tussled sleeping bags and pillows inside. Articles of clothing, a towel and some shoes had been thrown around outside of it. I’d balled up and ripped up some paper and sprinkled it around the mess. Some papers had scratchy marks on them drawn with crayons that lay scattered about the floor. A cooler lay open with broken up boxes and tin cans complete with large scratch marks down their sides. Then I’d sprinkled all this with garbage from my compost bin, including a number of banana peels. What was going on? Was I in desperate need of more housework? Or was there a purpose to my madness? What I had been doing for the past hour was creating a ‘crime scene’. The crime scene was going to be a tool to teach our kids a bit about deductive thinking. 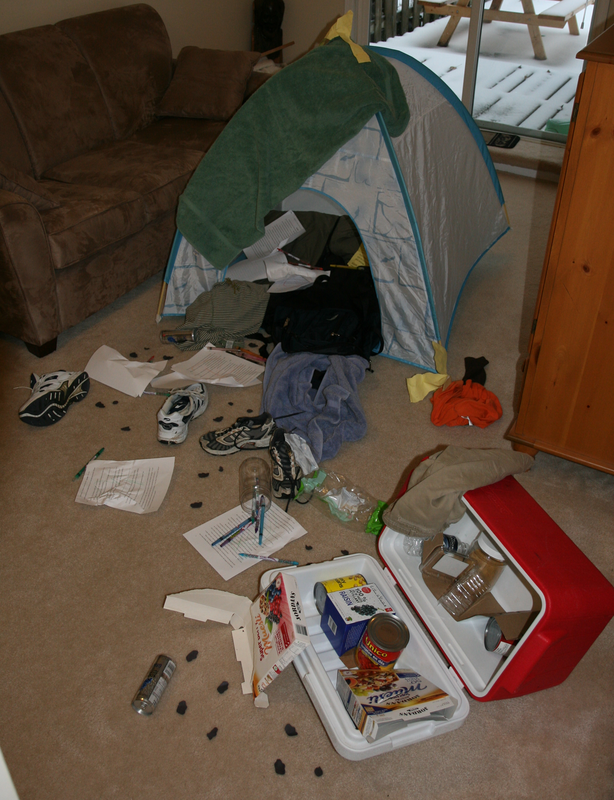 I had created a bunch of evidence in my campsite crime scene that would – hopefully – lead our kids to determine who had made the mess in the basement. When our boys came home from school, I had them dress up as detectives and go to the basement to figure out what had happened to the campsite. It took a lot of looking and thinking for them to determine what had happened. Our investigation was greatly assisted when I had them scour the basement for suspects. 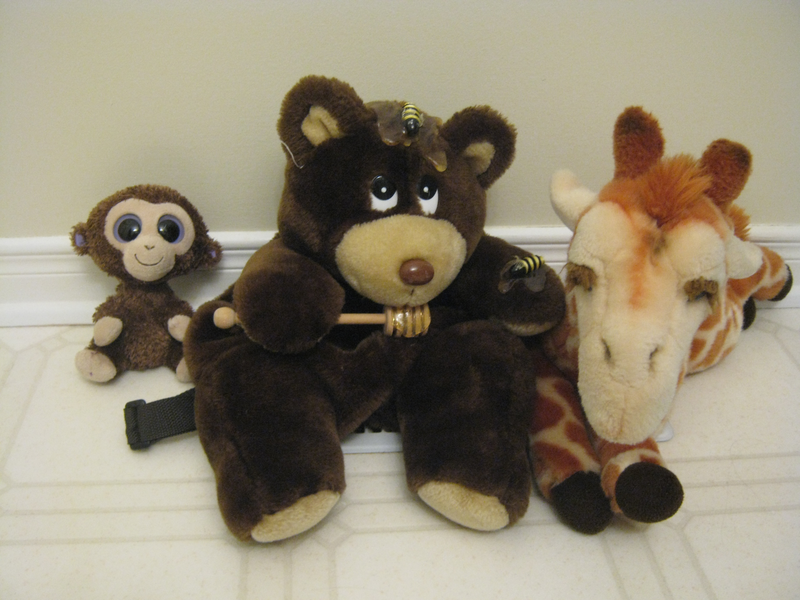 They discovered three stuffed animals hidden in various places. Now we had some tangible suspects to cross-examine. With help, the boys were able to figure out who messed up the campsite. A giraffe like George would be too tall to fit into the tent and mess it up. He also didn’t have claws to create scratch marks on the tin cans, nor would he have been capable of using the crayons to make the scribble marks on the papers. Honeybear would also have been too big to fit inside the tent. He had claws, but they were strong enough to have seriously dented the cans, not just to have left scratches in them. Plus, he couldn’t have scribbled with the crayons on the papers. 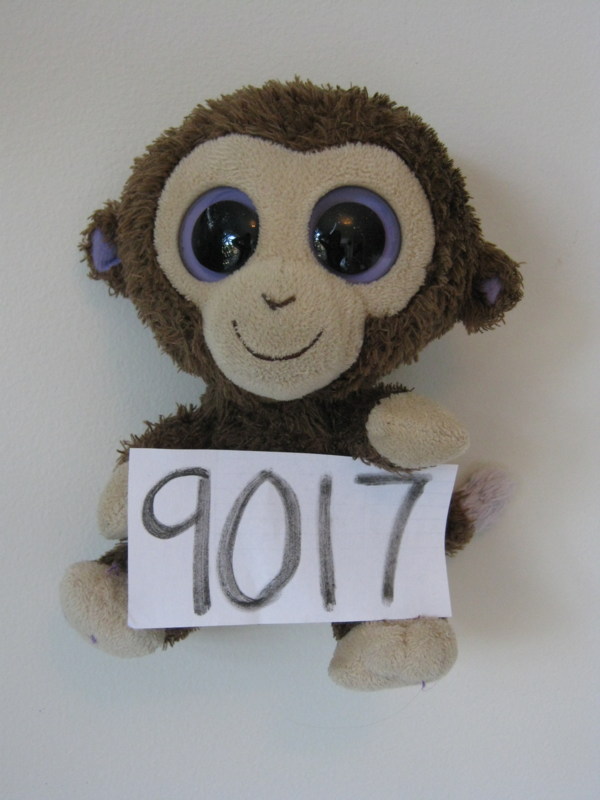 Cocunut the monkey fit all the clues and fingerprints of the scene. He was small enough to fit inside the tent, could use his hands to scribble with crayons, and would have been able to scratch the tin cans. Plus, he’d left banana peels everywhere. There was a point to all this. The exercise was designed to instill the idea of looking for clues to come to a conclusion about something. We determined which suspect was guilty of raiding the campsite in our basement by looking at the clues and fingerprints he’d left behind. We can do the same thing with God. If God did in fact create the universe and life, we should see evidence of His fingerprints on it. And we do see evidence of His fingerprints. Over the next few posts, I’m going to outline some fascinating things that we’ve learned about the universe and life, and illustrate how we’ve helped our young children begin to appreciate the evidence that God has left behind for us to discover. ← What Difference Does Studying The Bible Make? What a great way to teach young kids to think critically! Science has shown us that God’s ‘fingerprints’ are all over His creation. I clicked through to your blog from a comment you made on “Number One Sign Your Kids Are Borrowing Your Faith.” It truly was God’s timing, because I had just run out of Magic School Bus episodes to show my son for science class. Your “Fingerprints” series is going to become our new science curriculum! Thank you for sharing! Thanks so much for letting me know! It sounds like you are a homeschooler, am I right? I’d love to know how they worked for you, and if you made any modifications or came up with your own ideas to expand on them that can be shared with the rest of us!